You may create your own custom host application or we can provide our WRLS application (for Windows). The WRLS permits you to configure the WR-1000 controller, operate the relay, and create event schedules. Compatible with standard Wi-Fi networks, the WR-1000 controller is a self-contained device with wireless TCP/IP interface and AC adapter. Installation is a breeze. Simply mount the controller unit on a convenient wall or other surface and plug the AC adapter into a nearby wall outlet. Use our Windows PC host software to configure network parameters and specify a device ID. Onboard beeper (also remotely controllable). 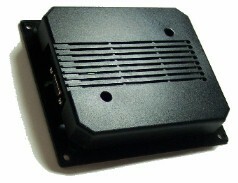 Slimline enclosure, measures: 5.5" x 4.75" x 1"
This design is available for OEM licensing. Licensing permits your company to manufacture this item and allows you royalty-free sales and distribution rights. Click here for additional details.